Never before seen silent Super-8 film of KISS in Stockholm 1976. Extended footage from the 1996 KISS Press Conference on the USS Intrepid. The Beyond Vaudeville Kiss Spectacular Program. 90 minutes of Outtakes from the film. DVD will be autographed personally by Bill Baker! 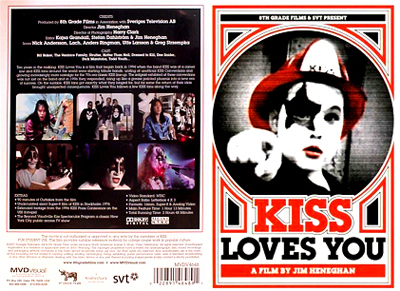 Not a cheap compilation of just a bunch of old clips strung together; KISS Loves You is a fully-produced professional film from director Jim Heneghan. 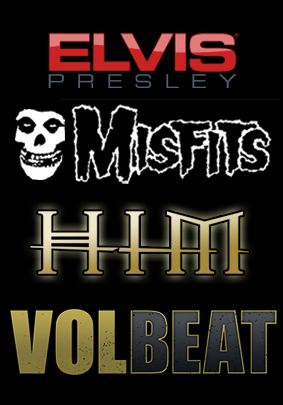 If you have ever attended a KISS convention, you very well may be on this DVD! Ten years in the making, KISS Loves You is a film that began back in 1994 when the band KISS was at a career low and KISS fans around the world were starting tribute bands, uniting at unofficial KISS Conventions and growing increasingly more nostalgic for the 70's era classic KISS line-up. The zeitgeist exhibited at these conventions was not lost on the band and in 1996 they responded, rising up like a grease painted phoenix into a new era of success. On the surface, KISS fans got exactly what they longed for, but for some the return of their idols brought unexpected consequences. KISS Loves You follows a few KISS fans along the way.